Katie Salomon is a professional harpist and teacher based in South-West England. 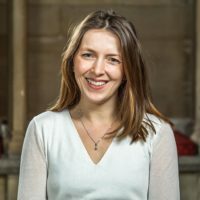 She first performed Britten’s Ceremony of Carols in Salisbury Cathedral with the cathedral choir whilst herself a young girl chorister, and first recorded it to great acclaim in 2002. She feels particularly close to Britten’s Suite for Harp, loving it as a showpiece for the instrument, having studied as a post graduate with Sioned Williams who in turn studied with Ossian Ellis, the harpist for whom Britten wrote this Suite. Her recordings with choir include performances of Bernstein’s Chichester Psalms and Janacek’s Otce nas, both works which feature the harp as a principal accompaniment instrument. She has recorded with record labels including Deutsche Grammophon, Universal, Decca and Demon. Katie is much in demand as a harpist. She enjoys all styles of playing from classical through to contemporary encompassing orchestral, chamber and solo performance. She has a reputation as a gifted accompanist to choirs in these more intimate pieces, as a soloist – as shown in her interpretation of the Suite – and a crossover artist invited to play at venues as diverse as Buckingham Palace, London Guildhall and Wembley Pavilion Arena with other highlights being solo stage performances for the Wimbledon Champions’ Award Ceremony, the Rugby World Cup and Royal Ascot.